I found a few interesting Christmas marketing initiatives by brands who have been pretty active digitally this year using latest and popular technologies. A really sweet Christmas campaign by American Express using Augmented Reality. “Talking Tags”, a creative name for the campaign, is a DM piece. American Express customers are sent DMs driving them to a website to see the experience online. On the site customers can create custom tags that can be printed and attached to friends presents. Using augmented reality users can add voice messages to these tags and hence the name “Talking Tags” telling their friends if they have been ‘naughty’ or ‘nice’. When the receiver scans the card a pair of lips appears with a customised Christmas message. A variety of eight different voices are available ranging from British aristocrat accent to an old granny’s voice. “Make someone happy” campaign combines street art, social media and projection mapping in form of Christmas Laser Graffiti on the streets of Ireland. Vodafone on their Playground Facebook page asked their fans to share special stories of their loved ones. Selected stories are delivered as a special treat on Vodafone Playgrounds’s Facebook wall for the friends’ loved ones. A few stories are projected as laser graffiti’s on streets in Ireland. The laser graffiti was designed by well know graffiti artists in Ireland. You can watch all videos on their Facebook wall. Who knew Guinness pints would be so much fun this Christmas! Christmas campaign called “Decorate your pint” engages users with Augmented Reality using Blippar technology. 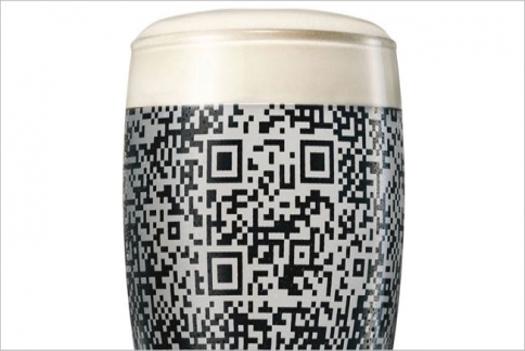 The image recognition technology of Blippar recognizes the Guinness label and reveals an overlay of Augmented Reality controls for users to decorate their pint. It seems like the app gave limited options to users. It would have been nice if there were more ornaments available, jingles and allowed users not just to share on Facebook & Twitter but also on Google+ I suppose now that it is slowly gaining popularity. The decorated pints can be shared on Facebook and Twitter. Check out some cool images on their GB Facebook page created using the Blippar. Heineken is engaging their 4 million Facebook fans with a lot of activities on their Facebook fan page. One of them involves a huge digital installation of a Christmas Tree on Clarke Quay, Singapore for their Facebook fans. It is created using 48 screens on a 11 meter tall installation. It will gather content from their Facebook page in form of a “Social Tree”, as shown in the video above. Christmas carols will be sung by 20 singers from all over the world. Using the app “Heineken Social Tree” on Facebook, fans can create a custom social tree. The custom social tree allows users to chose from “Christmas slogans” and “frames” and also select which friends you want to select from your Facebook. The Christmas tree is now live at Clarke Quay, Singapore. My tree went live on 20th Dec’11 at 8:28 pm. See the screenshot below as taken on the Social Tree app page 🙂 I am trying to get a copy of my video. I wish Heineken was better at sharing the social tree.